There are many ways to help us by volunteering - even if you can only give an hour a month. Some suggestions for volunteering are below. If you'd like to help, please let us know. If you'd like to make a difference to where you live and have few hours to spare a month, then a volunteer role in our Trust Management team could be the answer. The most important thing you can bring is that you care about where we live - here in the Blackwater Valley. But perhaps you're also a good organiser? Know a bit about customer service? Got some knowledge of, or an interest in, wildlife and conservation? Do you have any town and country planning knowledge? Maybe you have an IT background, or you might even be a whizz at social media? Knowledge of how charities and business work is helpful, but not essential. And these are only a few examples - any one or combination of them would be a great help,as will any other useful experience you may have. If you'd like to find out more, contact chair@bvct.org.uk or colin.wilson@bvct.org.uk for an informal, no commitment chat. educational and a great opportunity to meet new friends who share your love of nature. 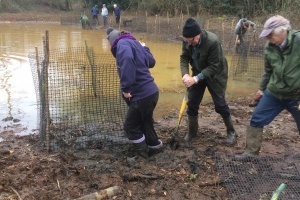 The Blackwater Valley Countryside Partnership, an organisation with which we work closely, organises a monthly volunteer programme of practical conservation tasks in the Valley. No previous experience is required. Volunteers work alongside Partnership rangers and are an important and valued part of the Partnership. To find out more about how you can help, please contact Jenny Sibley, BVCP Countryside Ranger, on 01252 331353.